This article is about the modern tram network that has operated in Nice since 2007. For Nice's first-generation tram system that operated from 1879–1953, see Trams in Nice. The Nice tramway (French: Tramway de Nice) is a 27.5-kilometre (17.1 mi), triple-line tramway in the city of Nice in Provence-Alpes-Côte d'Azur, France. It is operated by the Société nouvelle des transports de l'agglomération niçoise division of Transdev under the name Lignes d'azur. Opened on 24 November 2007, it replaced bus lines 1, 2, 5 and 18. From the start, the system had 20 Alstom Citadis trams in service, providing a tram every seven minutes. Since its inception, the number of passengers has increased from 70,000 per day in 2008 to 90,000 per day in 2011. The frequency has gradually increased to a tram every four minutes in 2011. Given the success of the T1 line, mayor of Nice Christian Estrosi decided to create additional lines. 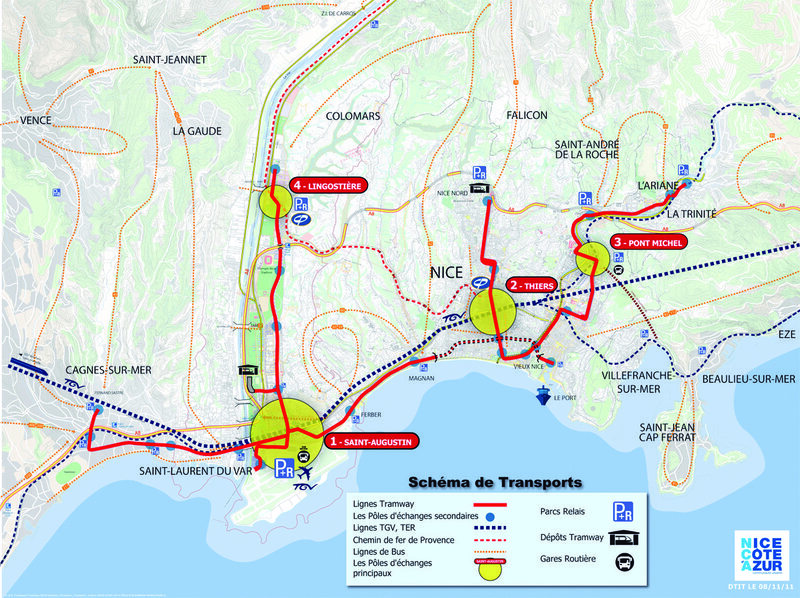 The West-East Line is to serve the Nice Côte d'Azur Airport to the west through the construction of a multimodal center and the Port of Nice to the east. This line will run through a tunnel in the center of Nice. A future extension of the West-East line, north along the Var valley, is proposed. Another extension, running further west from the airport, across the Var, is also proposed. 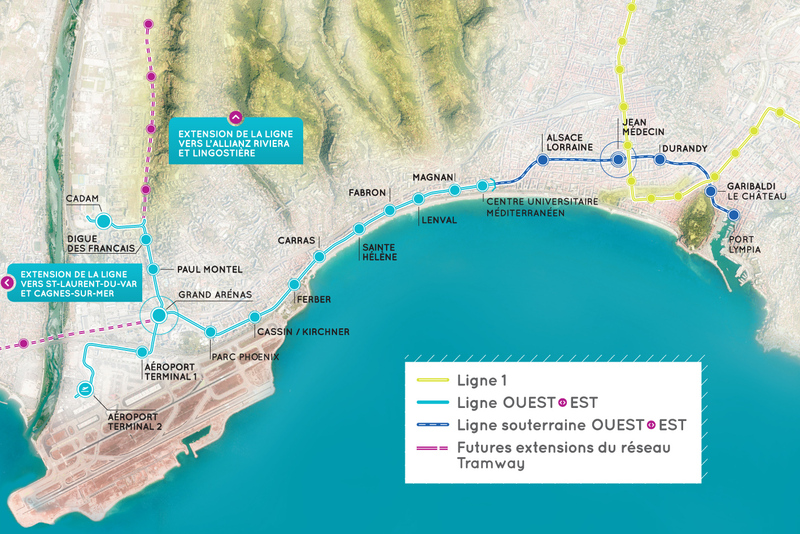 In addition, the Nice Côte d'azur urban region decided to extend line 1 to the Pasteur neighborhood. The first tramway in Nice opened in 1879, was electrified in 1900, and was followed by a departmental network in 1906. The entire network was electrified in 1910. In the 1920s, the network had 11 lines, some of which were partially used for goods transport. However, the tram was criticised and was replaced by buses on some lines beginning in 1927. The last tramway in Nice ceased service on 10 January 1953. Part of the Nice tramway track is lined by grass. Like many other French cities, Nice has major traffic problems, including the fact that most economic activities are concentrated in the centre. To overcome these problems, studies on the implementation of transit in dedicated lanes were conducted in 1987. The city of Nice began to implement dedicated bus lanes in 1997, and launched a study on the implementation of a tram line in 1998. Trams were chosen because they appeared to be more reliable than buses, since they are not subject to the vagaries of traffic, but they are less expensive than a subway line. The tram was declared a public utility in 2003 and work began the same year; the line was placed in service on 24 November 2007 after several weeks of technical trials, even though construction was not fully completed. In the months following the launch of the tram, there were between 65,000 and 70,000 passengers daily; the number rose to 90,000 by January 2011. The Nice tramway was designed to serve most of the population of Nice. As the city is situated on hilly ground by the sea, the first tram line was drawn as a U shape, passing through the city centre. A Nice tramway car pulling into the depot. Formerly called "Las Planas", the north-western terminus of the tramway was renamed "Henri Sappia" in July, 2013. The Henri Sappia depot is situated at the northwestern terminus of the line in the neighbourhood of Le Rouret, where the Count of Falicon and the Marquis of Rouret once owned large villas and many farms dotted the land. Above the tram terminus sport and cultural centres have been built. The plaza in front of the station has been raised and planted, with a fountain of water jets installed. The Fontaine du Temple neighbourhood where the Comte de Falicon tram stop is built has been remodelled for the arrival of the tramway. The plaza has been repaved and will host an outdoor market. Line 2 will run for 11.3 km of which 3.2 km near the center are going to be underground. Starting at the port in the east and ending at Nice Côte d'Azur Airport and Nikaïa in the west, serving 20 stations in total. Ridership expectations are 140,000 passengers per day. Work began in the second half of 2014. A €270m contract for building the underground section was awarded in December 2013. Service from CADAM to Magnan opened on June 30th 2018, service to the airport and Jean Médecin station opened in December 2018, and service on the complete line is planned for summer 2019, the journey is about 26 minutes from Nice Airport to Port Lympia. The total cost of the line is projected to be €770m of which the central government is contributing €52.8m. The cars of the Nice tramway are unique and have been designed to blend in with the Niçois architecture. They are based on the Alstom Citadis family of tramcars and were built near La Rochelle, Poitou-Charentes. A standard 5-car tram measures 35 m (114 ft 10 in) but extra carriages may be added, bringing the length to 45 m (147 ft 7 5⁄8 in). The tram is 2.65 m (8 ft 8 3⁄8 in) wide and can carry 200 passengers at 18 km/h (11 mph) compared to 11 km/h (6.8 mph) for the bus. It uses the 1,435 mm (4 ft 8 1⁄2 in) standard gauge . Nice tramway was originally to use the ground-level power supply third rail system as used by Bordeaux tramway. However, this was abandoned in favour of the more conventional overhead power supply cables providing 750 V DC, except where the tram crosses the Place Masséna and Place Garibaldi, when it lowers its pantograph and relies on its onboard nickel metal hydride batteries to cross these large open spaces, where overhead wires would be an eyesore. ^ "Qui sommes-nous? : La gestion des transports La société S.T.2.N. filiale de Veolia Transdev" (in French). Lines d'azur. Retrieved 2013-03-10. ^ "Le tracé de la ligne Ouest-Est" (in French). Tramway de la Métropole Nice Côte d’Azur. Retrieved 2016-09-21. ^ Beal, Sylvie (30 May 2008). "Nice - La ligne 2 du tram : tout de suite, plus tard, jamais ?". Nice-Matin (in French). Nice: Nice Matin Group. Retrieved 2011-07-14. ^ Casals, Sophie (20 January 2011). "Bus: ça roule, mais..." Nice-Matin (in French). Nice: Nice Matin Group. Retrieved 2011-07-14. ^ "RATP's tram network in Île-de-France". RATP. Retrieved 2014-12-16. ^ "Le terminus "Las Planas" change de nom et devient "Henri Sappia"" (in French). Tramway de la Métropole Nice Côte d’Azur. Archived from the original on 2013-10-06. Retrieved 2013-09-17. ^ "Contract awarded for Nice tram Line 2". Railway Gazette International. 18 November 2013. Retrieved 2014-07-21. ^ "Tout sur le projet" (in French). Tramway de la Métropole Nice Côte d’Azur. Retrieved 2016-09-21. ^ "L'art dans la ville, avec le tramway Nice Côte d'Azur" (PDF). agglo-nice.fr (in French). Archived from the original (pdf) on 2012-03-27. Retrieved 2011-07-11. ^ "Nice Tramway, France". Railway-Technology.com. Retrieved 2014-05-30. Wikimedia Commons has media related to Trams in Nice.